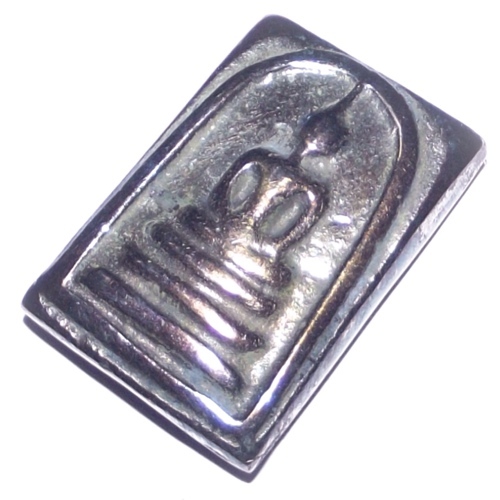 Pra Somdej Benjapakee amulet, conjured up from Holy Cave Lek Lai Kaya Siddhi elemental substance, with the fire Kasina Ritual, from Luang Por Huan of Wat Putai Sawan. 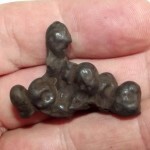 This is just one of many different shapes Buddha images and other kinds of amulets which were conjured up to be formed out of Lek Lai Kaya Siddhi elemental substance, whilst coaxing the substance into its form during the very long ritual which was performed by Luang Por Huan, within the sacred cave where the Kaya Siddhi Adamantine element was discovered. This ritual is a very mysterious event, which few have seen, and which have made this master perhaps the current top living master for dominating and controlling this most secret of secret Magical Wicha, namely, the ability to call and convince the mysterious Lek Lai Kaya Siddhi elemental substance to change its form into Buddha amulets, and assist living beings, through the path of Buddhism. One of the reasons why this master is seen as the most powerful, is, because, he is calling and invocation of the holy Lek Lai, was able to be documented to considerable extent with photography as the event was occurring and many witnesses were able to peek inside the cave, and see what happened. The result is a very faith instilling event and also, one which leaves one self baffled to a considerable degree, after witnessing the strange occurrence of amulets forming by themselves, only through the power of incantation and cold flame. 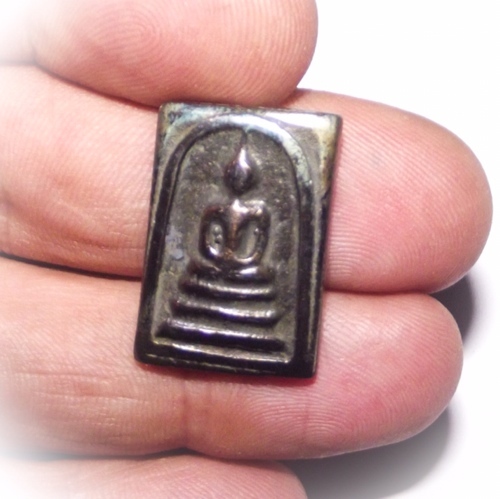 In addition to the obviously attractive and interesting factors of this amulet being made from Lek Lai, and having been extracted from the Cave using authentic Magical Wicha by Luang Por Hone, this Pra Somdej amulet, is also one of the Classic Benjapakee family of amulets. 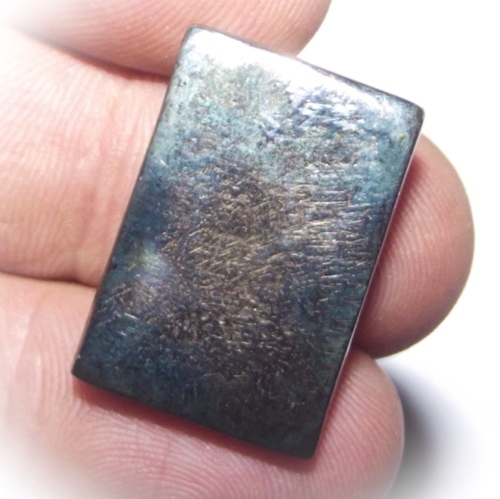 This makes it extremely attractive both for reasons of magical power and Sacred value, but also for collectibility and showcase credibility, is this amulet an absolute winner. 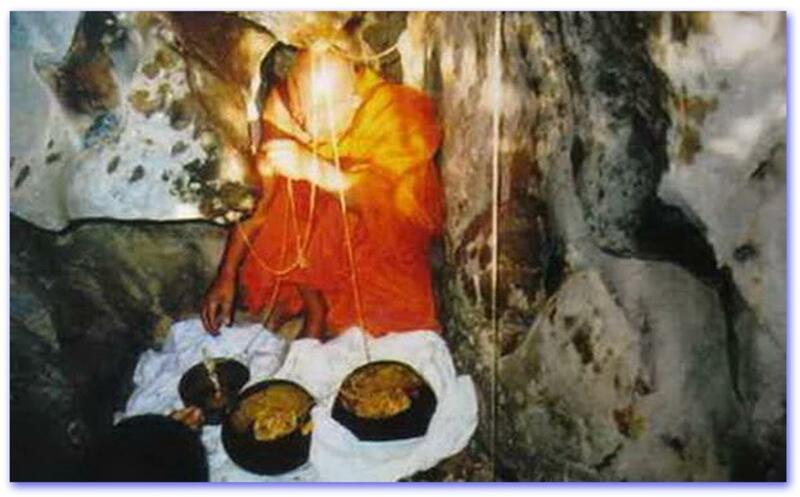 It is Lek Lai Tham (cave lek Lai) which has been extracted using the ancient magical Wicha (some forms of Lek Lai are manually extracted and do not possess the same super powers as that extracted by a pure hearted monk with powerful Wicha). 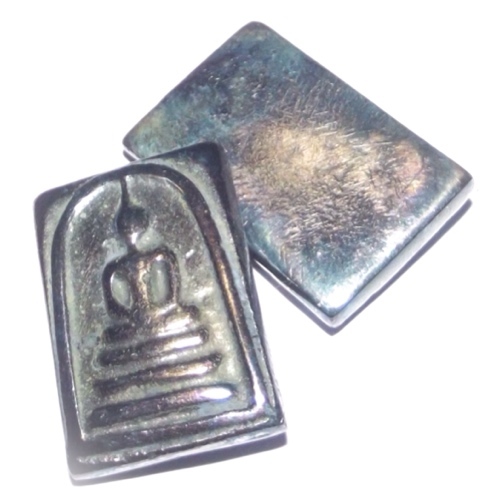 This amulet is pure Lek Lai Nam Neung (first class cave Lek Lai) and is ‘See Peek Maleng Tap’ (a purply blue metallic color). Its metallic sheen has a enticing aura to it. 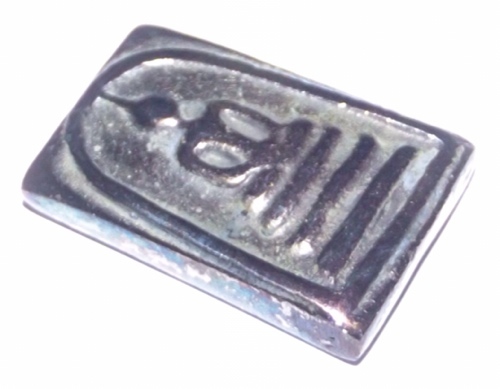 Extreme Protection and Wealth Increase is awarded with this amulet. 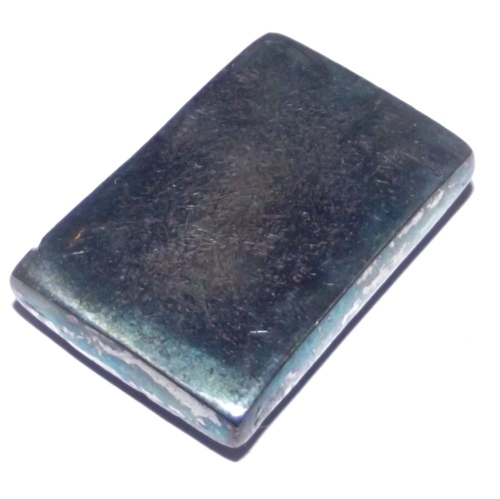 Dimensions; 3 Cm high 2 Cm wide. Luang Por Huan of Wat Putai Sawan, is perhaps the most famous master of all in Modern times for his ability to summon and cut Lek Lai from within the stone walls of ancient caves, and to use his meditative skill and incantation mastery to charm and coax it along the sincana cords into his alms bowl, where it takes on different shapes and forms as amulets, which Luang Por Hone had pre-cast wax candles carved into the shape of the different amulets he wished to be formed. The Lek Lai then mimics the form of the wax effigies and begins to take shape as the wax melts within the alms bowl. 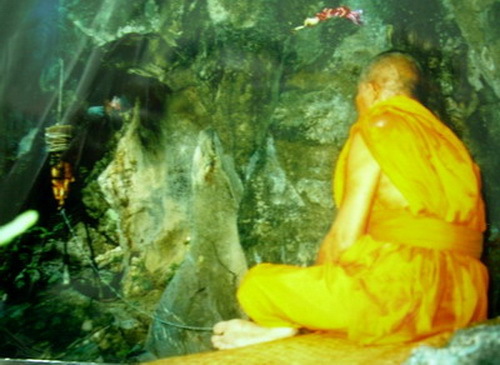 The Invocation and Manifestation if Lek Lai was achieved with Luang Por Hone performing the ‘Piti Dtat Lek Lai’ himself within the sacred cave. Once collected, it was then charmed into the shape of amulets in different forms and sizes, and given empowerments at Wat Puttai Sawan. Before beginning anything else, Luang Por Hone would project his mind to seek out which cave the Paya Lek (Lek Lai) was residing in. Once he had determined with his psychic powers where the Lek Lai was, he would took some of his Devotees with him to the place and let them investigate, for all to see with their bare eyes what was there. After this, the selection of an Auspicious and safe date and time to perform the Ritual was chosen. Luang Por Hone said that a cave with Lek Lai present within it, will be a clean cave with no bats living inside it. 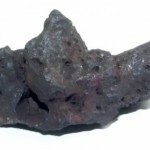 In most cases, it will be a marble or granite cave with a cool soft smooth surface. This kind of cave is sometimes even freezing cold inside. 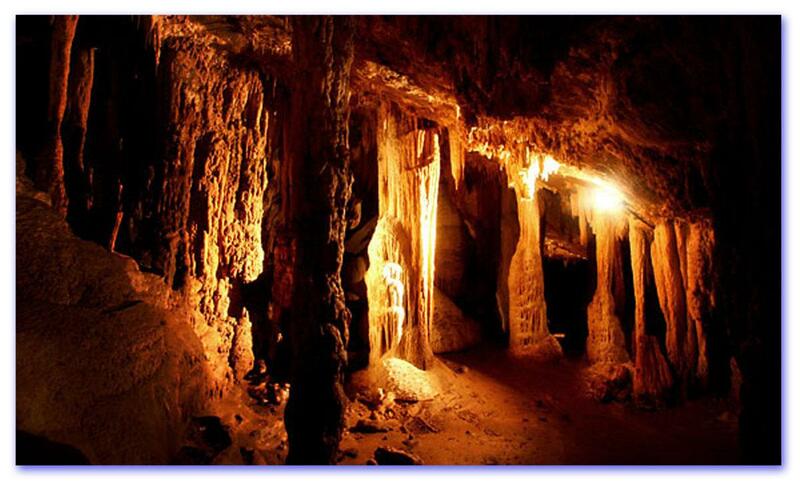 The cave will be dry and without moisture or inundation. Apart from the ‘Krueang Buang Suang’ (Offerings and Ritual Instruments) needed for the Ceremony, it is essential to have some pure Honey and Beeswax, which LP Hone had already prepared and brought along. The Devotees and entered the cave and sat to spectate as Luang Por Hone began to prepare to open the Ceremony. The offerings were arranged and ceremonial incantations performed in a very similar way as performed in the preamble to Puttapisek and Wai Kroo ceremonies. The ceremony and offerings serves the purpose of informing and asking permission of the Jao tee Jao tang (Local Devas) and the Spirit of the Cave which guards the Lek Lai, that the Lek Lai is to be taken and used for the benefit of the Buddha Sasana (For a detailed description of which offerings are used in such a ceremony, I recommend reading my first ever Ebook ‘Sak Yant Buddhist Tattoos’). After the Piti Buang Suang was completed, Luang Por Hone focused his mind and applied the Wicha which he learned from his Lineage Masters and developed with meditation. He continued until he had raised the correct psychic energy within his mind to perform the next step. Then he took the pure wild honey, and smeared it on the crevices of the cave, anointing the cracks in the walls of the cave, chanting Kata Akom the whole time as he anointed the walls of the cave with honey. He chanted the whole time until the walls are anointed with honey, and then stands and closes his eyes, remained very silent and focused his psychic powers. 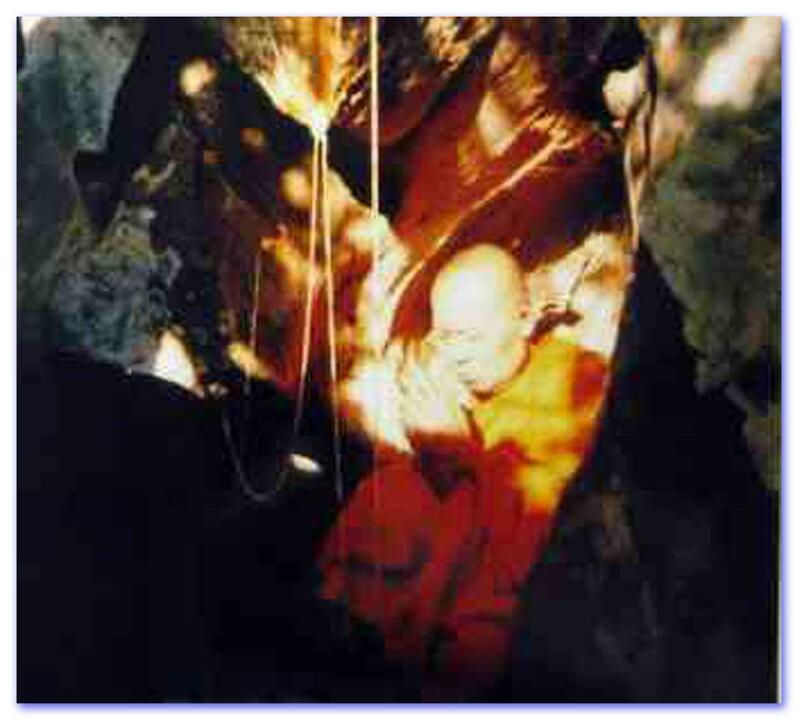 The Devotees present in the cave were then able to witness something miraculous; Along the cracks and crevices of the cave, a substance had begun to ooze out as if attracted by the honey which Luang Por Hone had smeared along the crevices of the cave. Luang Por Hone then took his ‘Sai Siin’ (Sinjana Cords – a thin white cord used in Buddhist rituals), which he had previously soaked in honey, and inserted one end of the cord into the crevice which he had anointed with honey, and then brought the other end of the cord to fall down from the wall of the cave into the ‘Badtr Nam Montr (large almsbowl normally used as a prayer water receptacle). The Badtr Nam Mont contained a generous coating beeswax, and a white cloth covered with Sacred Yantra Inscriptions covered the Badtr Nam Montr. Only a small hole in the white cloth which covered the alms bowl allowed the Sai Siin cord to pass through into the bowl. This is the method to trap the lek Lai, by enticing it to travel along the cord eating honey along the way, until it ends up inside the alms bowl. Because of the magical spells written on the Pha Yant (Yantra cloth), the Lek Lai cannot escape and return to the wall of the cave. Once Luang Por had inserted the cord through the Yant cloth into the Badtr Nam Montr, he took the candles he had made especially for this ritual using the pure wild beeswax, and rolled the flame of the candle along the wall of the cave, illuminating the wall where the Lek Lai was flowing out. As he did this, he constantly performed Incantations of Kata Akom to coax the Lek Lai to travel along the Sai Siin cords to consume honey inside the Badtr Nam Montr. There were three different colored Lek Lai which dribbled down into the Badtr Nam Montr; ‘See Maekapat’ (a dark blue-green metallic color), ‘See Ngern Yuong’ (molten silver color) and ‘See Tong Pla Hlai’ (golden brown color). 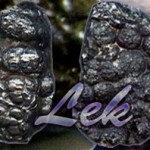 The color changes depending on what kind of Lek Lai it is that is present in the cave. 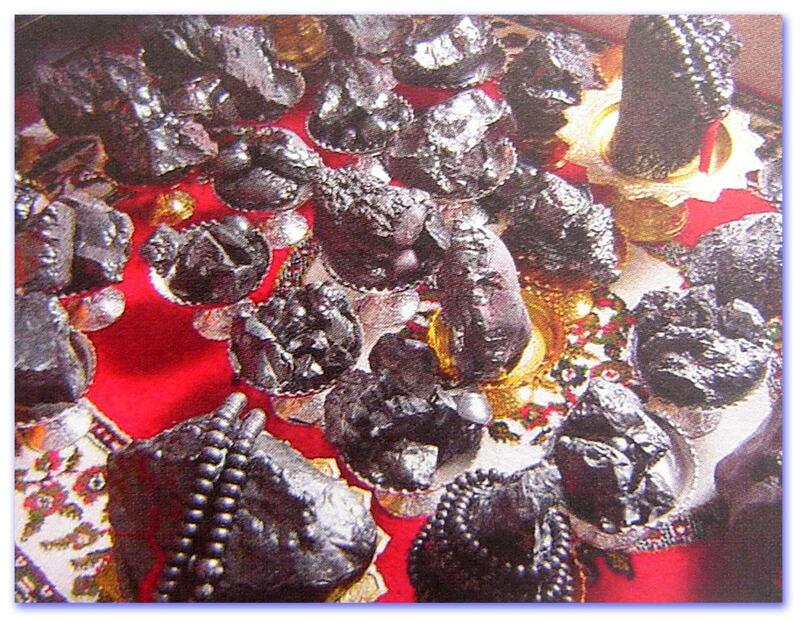 Most of the Lek Lai types which Luang Por Hone will call is the blue-green ‘Maekapat’ and molten silver colored ‘Ngern Yuong’ types, for he says these two types are able to be shared and distributed to the laypersons and devotees easily. But he does not prefer to give the Lek Lai See Tong Pla Hlai of golden brown color to those who come to make merit, because it has very strong magic within it, which can affect the person wearing or carrying it to become very arrogant and cause much disturbance and problems both for others and for themselves. Once the Lek Lai had traveled along the Sinjana cords into the alms bowl whilst still in liquid form), Luang Por Hone took it to perform the next ritual act, namely to induce the Lek Lai to solidify. He took the Badtr Nam Montr, and placed it on top of a fireplace. He then took the bees wax, which had been carved and formed into various shapes and images which are spells to communicate to the liquid Lek Lai in the alms bowl that it should form itself into different shapes and forms to become Buddha amulets. Above Pic; ‘Lek Lai Hung’ – Lek Lai charmed into shape using wax effigies to communicate the forms which the Lek Lai should assume. Some of the forms created were Pra Kring, Pra Somdej, Luang Por Tuad, and Buddha images. Other shapes such as a rugby ball shape and smaller shapes for insertion into other amulets were also made. The wax shapes have a ‘Sai Chanuan’ (wick), like the Tian Chai Victory candles seen in Putta Pisek Ceremonies. This is in order to ignite and heat the receptacle for the Invocation of the Lek Lai to take form and shape itself into amulets. Luang Por then lit the wick of the brazier and began his Incantations, as the wax melted in with the still liquid form Lek Lai in the alms bowl. As the wax became runny, the liquid Lek Lai began to congeal and emerge in solid form, Miraculously appearing in different shapes and forms. The Lek Lai transformed into exactly the same shape as the carved wax effigies which had been melted down in the alms bowl with the Lek Lai (Pra Kring, Pra Somdej, Pra Nang Paya, Pra Sum Gor, and other shapes. 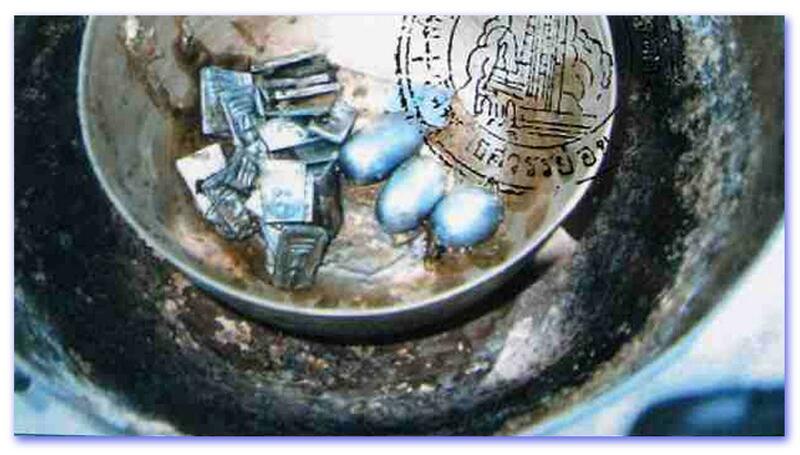 The amulets that emerged were much smaller than the original wax effigies melted down in the alms bowl. The Lek Lai were of different colors with strange and wonderful auras to them, glinting different colors under different light. 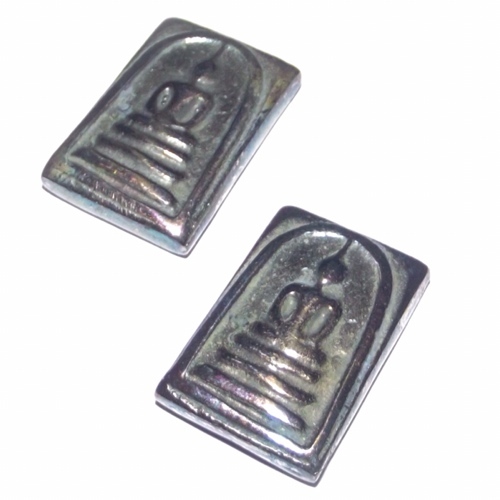 Once all of the Lek Lai had formed itself into amulets, Luang Por took them and performed ‘Piti Suad Yadti’. Above; Lek Lai in Torpedo and Somdej shape which was conjured during the Ritual. This Ritual is a binding spell to prevent the Lek Lai from changing back into its original fluid form, or escape back to its lair. After this, Luang Por would make further Incantations (Pluk Sek), and then he handed out some of the Lek Lai amulets to the Devotees who had attended and made Merit. Left; Mysterious Emergence of Lek Lai Taat Gaayasit . As the bees wax of the candle melts, the Lek Lai somehow appears from within and begins to emerge, slowly taking form and shape. This image was recorded by the Ounamilit Team of Paranormal Documentalists. 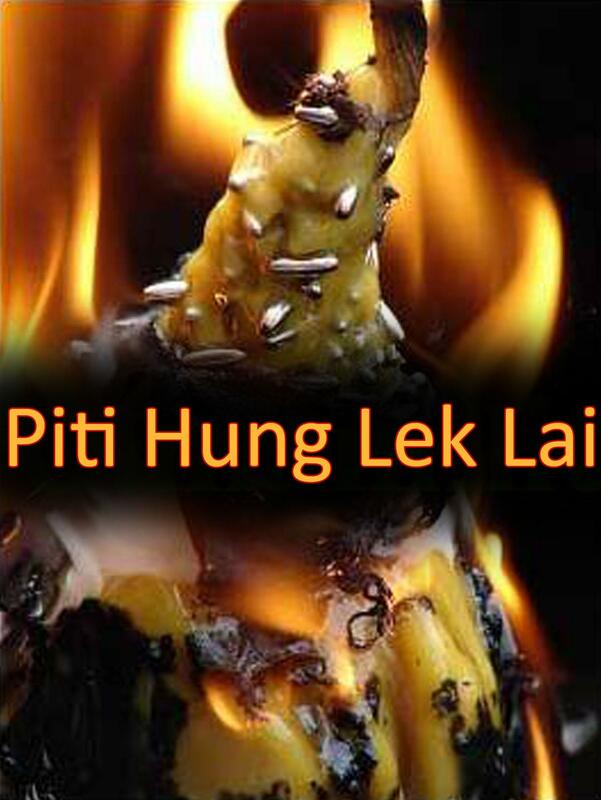 This method of creating Lek Lai amulets is called ‘Piti Hung Lek Lai’. Lek Lai related articles coming soon on lek-lai.com blog section!